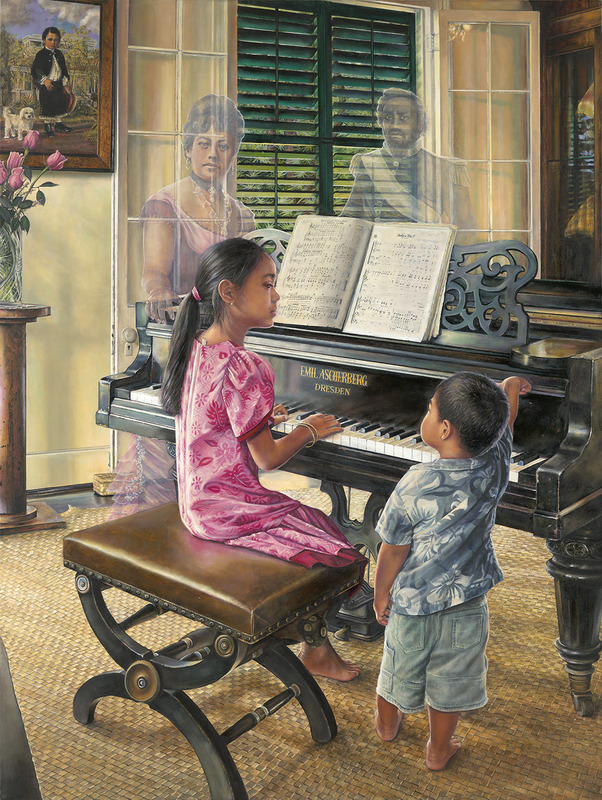 This painting is my tribute to Queen Emma… Hawai’i’s remarkable and beloved humanitarian who became so instrumental in the founding of St. Andrew’s Episcopal Cathedral, St. Andrew’s Priory, Iolani School, St. Cross School on Maui (no longer in existence) and the Queen’s Medical Center. The physical setting is one of the front rooms of the Queen Emma Summer Palace on the Pali Highway. In the lefthand corner of the painting hangs the well-known painting of Prince Albert, only son of King Kamehameha IV and Queen Emma. The little prince died at the young age of four. Against the light filtering through the shutters, is the spirit image of Alexander Liholiho, Kamehameha IV, who passed away a year later before his thirtieth birthday. To the side of the piano is the spirit image of Queen Emma, her hand resting on the piano as if in approval of the children’s music. After a period of grieving the loss of her loved ones, the young queen emerged stronger and more resolute in pursuing the goals she had shared with her husband. In the foreground sits the piano that the queen purchased in Germany in 1866 in her travels to procure funding for St. Andrew’s Cathedral. She perpetuated her belief that the culture would only survive through the education of the children and, to that end, loaned her piano for the purpose of teaching. She continued to work tirelessly to promote the Hawaiian culture until her death in 1885 at the age of forty-nine. In the vase beneath the painting of the young prince are pink roses, the queen’s favorite flower. She had found great solace in her gardening, especially her rose bushes. The real life models are a young girl from my own parish (St. Peter’s Episcopal Church in Honolulu) and my little grand nephew, Kaipo.